We do participate in National & International Trade Shows. 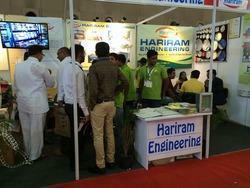 Incorporated in 2005, we, Hariram Engineering, are a proprietorship firm that is proficient in the manufacturing, supplying, trading and distributing of an ample range of premium quality Paper Plate Making Machines & Raw Material. The comprehensive range of products offered by us is comprised of Paper Plate Machine, Automatic Paper Plate Machine, Disposable Plate Making Machine and so on. 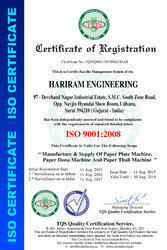 We also provide the services of our products. Made under the stringent surveillance of professionals and experts, the entire range of high quality machines offered by us has fetched high demands in the market. We are backed by a sophisticated infrastructure facility and a dextrous team that aids us in making the offered range of utmost quality machines available to our valued patrons. Attributing to the assiduous efforts of our diligent team, we have earned the desired goodwill in the market. Our team of quality controllers checks the entire range of products to be offered on various parameters and hence assures a defect-free range of products for the clients. Under the mentorship of Mr.Gautam Chandu, we have carved a vast niche for ourselves. His able guidance has enabled us in delivering high quality products to the revered clients. Owing to his intense experience in the domain, we have developed a strong foothold in the market.We are further committed to follow ethical business practices that have enabled us in attaining the valuable trust of our clients.